These flashlights are ideal for a number of uses. 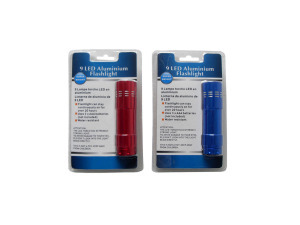 These feature 9 LED lights and provide a bright white light. These are water resistant and can provide up to 20 hours of use even if left on. Requires 3 "AAA" batteries, not included. Each measures 3 1/2" long. Colors are blue and red. 8 pcs. 16 pcs. 24 pcs. 32 pcs. 48 pcs.